Christine L. B. Selby, PhD, is associate professor of psychology at Husson University, in Bangor, Maine, and is a licensed psychologist at a part-time private practice. Selby, Christine. 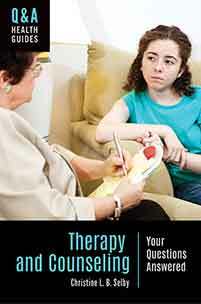 Therapy and Counseling: Your Questions Answered. Greenwood, 2019. ABC-CLIO, publisher.abc-clio.com/9781440861680. This book provides teens with an accessible introduction to counseling, psychotherapy, and other related services. The information, guidance, and resources it offers make it a valuable tool for young adult readers seeking professional assistance with their mental health concerns.